December, 2007 | H&R Group K.K. Eating out in any big city in Japan provides a great chance for you to sample some great Japanese cuisine along with a range of international foods including; Italian, Chinese, Indian, Mexican, French and Moroccan. Bento （弁当) – Japanese prepared lunch consisting of rice and small portions of other foods such as fish, chicken, vegetables, pickles, etc. This kind of fare is readily available and priced from very low to very high. There are even shops that specialize only in obento. Izakaya （居酒屋）– a Japanese pub, where the food is meant to be an accompaniment to the drink. Usually small dishes are shared by the whole table. Kaiseki and Honzen ryori （懐石•本膳料理）– traditional cuisine served in many small courses. This can be quite expensive, especially when served by waitresses dressed in kimono. Sukiyaki （すき焼き）– probably one of the most well known Japanese foods in the Western world. Thinly sliced beef, cooked together with various vegetables, tofu, and a kind of noodle (in the Nagoya area this is usually kishimen) in a communal iron pot at the table. Stock mixed with water, shoyu (soya sauce), and a little sugar makes up the cooking sauce. You take the hot ingredients from the pot to your own bowl and dip in raw egg. Shabu Shabu （しゃぶしゃぶ）– is very similar to sukiyaki except that the meat is usually of higher grade and is boiled in water rather a broth. It is also eaten with a sauce not raw egg. Sushi （寿司）– many Westerners believe this means raw fish which is not actually true. There are many different types of sushi, the best known being nigiri-zushi which is raw fish on a lightly vinegared rice ball. Norimaki is also a very popular type of sushi. Norimaki consists of a piece of raw fish or cucumber at the center wrapped in rice and nori (seaweed). The sushi is then dipped in shoyu (soy sauce) and mixed with wasabi (green horseradish), accompanied with pickled ginger. It is usually more appropriate to use chopsticks when eating sushi but use of fingers is not frowned upon and in fact is the traditional method of eating sushi (that’s what the hand towels are for, before you eat). Sashimi （刺身）– is very elegantly sliced raw fish. It is usually served on a bed of shredded daikon (radish) or a shiso leaf. Tempura（天ぷら）– consists of seafood and vegetables, lightly battered and deep-fried. It can be purchased in very high-class restaurants or from your local supermarket. 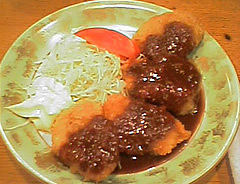 Tonkatsu （とんかつ）– is breaded pork cutlet (sometimes chicken and shrimp cutlets also) which have been breaded and deep-fried. In Nagoya, miso-katsu, tonkatsu with a miso based sauce is a local speciality. Yaki-tori （焼き鳥）– usually grilled chicken on a stick. Popularly served in izakaya style restaurants. Noodle Shops – are great places to catch a quick bite to eat and where you’ll find many people also slurping down bowls of hot (in the winter) and cold (in the summer) noodles. The different types of noodles include: udon noodles（うどん）, which are thick wheat based noodles, soba noodles （そば）which are long and skinny noodles made of buckwheat sometimes served cold as zaru soba（ざるそば）, and a ramen （ラーメン）which are thin Chinese noodles.